There’s a new C-word. And to some, it’s just as, if not more, offensive than the original. Curator. There are a lot of them. There are those that were around before anyone even noticed they existed, putting on exhibitions and events with little to no fanfare, and then there are the others. The ones that provoke hatred, anger or indifference. I’m one of them and I’m well aware of what a hypocrite this makes me. I trained at art school (like many other C-words) and failed to make any sort of career in the aftermath. By this of course, I mean that I failed to make money, not art. My love of writing made me consider a more academic and less expressive career. I enrolled in a curating course out of the desperation to have a career in the arts which might afford me some sort of control over my situation. And this is part of the problem. Yet another c-word: control. There is this overwhelming belief that C-words control everything. They are the barriers and hoops that artists have to jump through to get anywhere, and if that wasn’t enough, some of them have done away with the artist altogether and become one themselves. Are you paranoid yet? I am so paranoid that every decision I make, project I become involved in, or person I talk to, requires so much prior-thought that I have a permanent C-word headache. I am divided in two. I have a self-enforced split personality and my two personas keep arguing with each other. When I’m an artist, I’m an artist. When I’m a C-word, I’m a C-word. If I dare to cross these lines, even for an instant in my mind, that’s where the real headache begins. The truth is, C-words are not artists. Artists can be C-words. They can involve curatorial process in their artistic practice, but C-words should not be artistic. Creative, yes. They are idea-smiths, contributing their own thoughts on the interpretation of work or concepts, offering proposals for shows that might offer a new perspective. They are the erected walls and the ones that offer to knock them down. They are dangerous and yet they are the ultimate safety net. It’s odd that there is this obsessive hatred over something designed to be so supportive. It seems that one bad experience, with one bad egg, can lead to a lifetime of fear and cynicism. I feel myself being cynical about my own thoughts. Testing my motives for toxic levels of vanity and self-flattery. The thing about a C-word is that they must always be there to organise, to assist and protect, but the moment they step out of their designated role they should be prepared to fall, heavily. Should we be scared of them? Maybe. 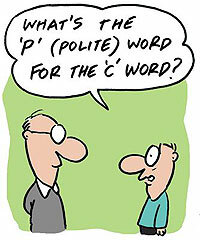 All I know is that there is a new C-word and on occasion it is uttered with all the severity of the original.